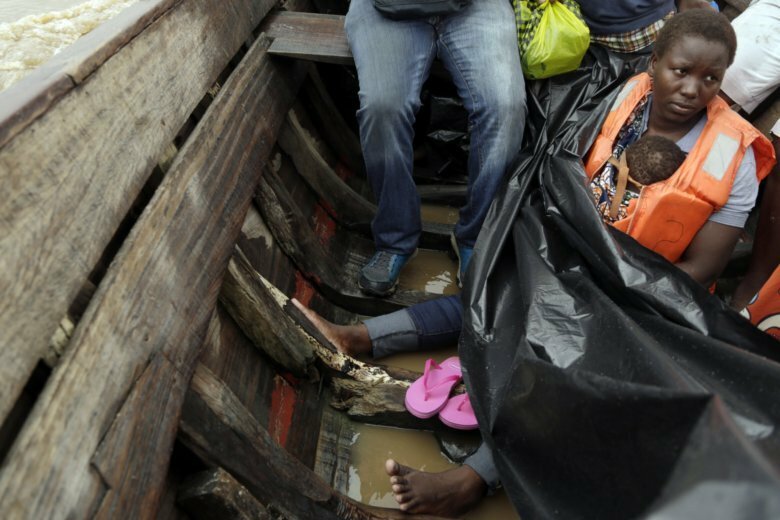 BUZI, Mozambique (AP) — The young mother huddled on a wooden boat clutching her 2-year-old daughter, headed for the unknown: The flooded town of Buzi, which thousands have fled with little but the clothes on their backs. Fishermen’s boats have been ferrying out Buzi’s displaced, sometimes scores of people crammed into a single vessel. But Veronica Fatia was going against the tide, up waters that only recently carried corpses to the sea. She was looking for her mother, hoping she was still alive. Ten days after the fierce rains and winds roared in, the death toll stood at more than 750 in Mozambique, Zimbabwe and Malawi — a count that was certain to rise. Thousands of families swept apart by the storm were now seeking to reunite. After a three-hour journey Fatia stepped carefully out of the boat and walked into the remains of Buzi, a once bustling riverside city of 200,000 now reduced to homelessness and despair. She passed the shuttered Jesus Saves Bank and a nearby three-story building where residents clustered on the rooftop in search of a signal for their cellphones. She passed people living in the open along the sandy main road. Some were cooking, others building crude shelters. A young boy read a textbook. Her mother might be at the school, Fatia thought. A cry went up as she approached the building and people came running. “Mama!” she shouted as she caught sight of her mother. They embraced on a concrete walkway now filled with cooking fires and small children, one nodding off beside a pile of warm ashes. “My home is gone, but I’m still happy because I can see my family,” Fatia said. But the fate of her other daughter, in Quelimane further north, remains unknown. It is a common heartbreak for thousands of families in central Mozambique, who have no way to learn about missing loved ones as destroyed communications networks struggle to return. People are desperately searching for family members separated by the flooding, destruction and death. Many will not be as lucky as Fatia. The fishing boats between Buzi and the cyclone-shattered port city of Beira about 125 miles (200 kilometers) away are now a lifeline carrying survivors and essential supplies, braving bursts of rain, rolling waves and the ever-pervasive stench of death. Near Buzi, a dog’s carcass hung from the branches of a tree. Cut off from the world, people can easily panic. One member of the Mozambican Red Cross, Assane Paul, tried to calm a knot of people in Buzi who had heard a rumor that another cyclone was on the way. Others tried to adapt however they could, from the Bible reader on the rooftop who blamed the cyclone on people’s sins to the man walking down the road in soaking wet trousers. They were the only clothes he had, he explained. It was very much wash and wear. Many people were still on the move. Dozens waited at Buzi’s small pier for the fishermen’s boats to pull up, bags of belongings at their feet and concern on their faces. Others simply watched for news. At the other end of the journey, the beach in Beira, children and barefoot women were carried off a fishing boat and gathered together by aid workers in the rain. Some looked lost. Few carried much. One small girl stood alone, hugging herself, her eyes wide and pleading. Christina Machado came with her two children and a bandage on her ankle. It was cut by a tin roof during the cyclone, she said. It was treated just yesterday. “I’m looking for my husband,” she said. He had been working in Beira for two months. She didn’t know where she would be taken next. Francisco Mambonda spent about a week on a rooftop with nothing to eat. He and his wife and sons drank muddy water to survive. Still, there was a ray of hope for emergency crews. As night fell and one wooden boat from Buzi approached the flickering, generator-lit Beira skyline, another passed in the dusk. It carried soldiers to their duties. Some raised their guns and cheered.